While the New Hampshire Senate starts reviewing the House budget, crossover – when each chamber considers the bills the other passed – begins in earnest. This week, expect the Senate to vote on bills restricting young people from working at night, a ban on asking job applicants their about criminal records before an interview and an increase the net-metering cap fivefold so large businesses and institutions can take advantage of renewable energy. House committee votes are scheduled on expanding workers’ compensation coverage and loosening the work requirements of expanded Medicaid. And there will be hearings on increasing pollution fines, cutting the allowable arsenic standard in half, banning offshore drilling, increasing foreclosure protections, mandating prevailing wages on state projects, updating the building code and increasing renewable energy standard from 25% in 2025 to 60% in 2040. At 9:10 a.m. on House Bill 614, which would double most air pollution control penalties. It also would add a clause that would count each violation as a separate offense, which would greatly enhance penalties. At 9:45 a.m. on HB 261, which would cut arsenic limits in drinking water by half. At 10:30 a.m. on HB 494, which would declare the Coakley Landfill in North Hampton an imminent hazard and direct the Department of Environmental Services to contain it or clean it up. At 10 a.m., the House Children and Family Law Committee will hold a hearings on SB 246, which would toughens the criminal records check requirements for licensing child care providers. At 1 p.m., the Senate Commerce Committee will hold a hearing on HB 309, which would require that a mortgage foreclosure must be served by the sheriff of the county where the property resides, rather than by mail. It also allows a mortgagor to stop a foreclosure via a court complaint rather than petition. At 1 p.m., the House Election Law Committee will hold a hearing on SB 156, which would requires that a political contribution by a limited liability company be allocated to members for purposes of determining whether a member has exceeded the contribution limits. At 1:30 p.m., on SB 41, which allow and regulate historical racing. At 2:30 p.m. on SB 270, which would provide $500,000 worth of credits against the business profits tax for businesses donating to career and technical education centers. At 2 p.m., the House Municipal and County Government Committee will hold a hearing on SB 154, which would enable municipalities to adopt a credit against property taxes assessed on workforce housing. SB 74 , which would increase the register of deeds fees used to support the Land and Community Heritage Investment Program (LCHIP). SB 76, which would prohibit offshore oil and natural gas exploration off the shores of New Hampshire. At 9:40 a.m. on HB 710, which would give the Building Code Review Board limited power to rule on local building code amendments and to maintain a publicly accessible list of such amendments. At 10 a.m. on HB 562, which would updates the definition of the state building code from 2009 to 2015, including some but not all of the energy code. At 10:15 a.m. on HB 259, which would require violation notices issued by a code enforcement authority to reference the relevant section of the state or local building or fire code. At 10 a.m, the Senate Ways and Means Committee will hold a hearing on HB 700, which would establish a methodology, phased in over a five year period, for the property tax valuation of electric, gas, and water utility company distribution assets. At 10 a.m., on SB 24, which would update New Hampshire’s regional greenhouse gas initiative program, so it conforms to the regional programs increased goals to reduce emissions. At 11:30 a.m. on SB 72, which would repeal the requirement that the public utilities commission estimate and give credit for the total yearly production for customer-sited sources that are net-metered. At 1 p.m. on SB 124, which would increase renewable portfolio standards each year after 2025 (when it is to reach 25 percent) so that it will end up at 60 percent by 2040. At 2 p.m. on SB 168, which would increase the solar renewable portfolio standard from .07 to 1.9 percent in 2020 to 5.4 percent in 2025. At 10 a.m. on SB 271, which would require prevailing wages and benefits on state-funded public works projects. At 1 p.m. on SB 2, which would cut unemployment compensation taxes and increases the amount that can be spend for job training. 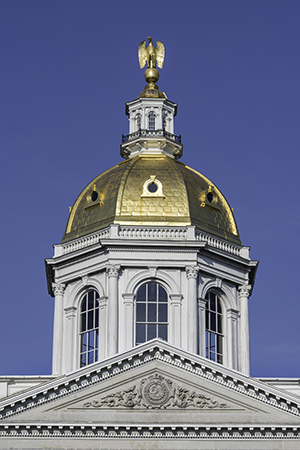 At 2 p.m. on SB 12, which would establish the New Hampshire college graduate retention incentive partnership (NH GRIP), providing financial incentives to college graduates who are hired by participating employers. It offers only $1 in funding. SB 151, which would establish an administrative hearing procedure and penalty for an employer who fails to make payment of wages or who fails to secure workers’ compensation coverage. SB 197, which would outlaw noncompete agreements for workers who make less than twice the minimum wage. SB 99, which would remove the caps on how long a worker can collect on a partial disability. SB 62, which would allow seasonal workers who know they have a definite date for going back to work to seek to collect unemployment benefits. SB 59, which would add post-traumatic stress disorder and acute stress disorder to the definition of “injury” for purposes of workers’ compensation. SB 225, which would give physician assistants the same authority as doctors in certain mental health practices. SB 290, which would loosen the work requirements needed to get expanded Medicaid coverage. SB 293, which would reimburse healthcare centers for services provided to persons whose Medicaid eligibility has been suspended for failure to comply with the work and community engagement requirement. The House Criminal Justice and Public Safety Committee will vote on SB 173, which would make it easier to make a criminal records check for employment and occupational licensing. HB 223, which would not allow a youth to work more than an eight-hour shift if he or she works two night shifts that week. HB 253, which would prevent potential employers from asking about criminal history prior to an interview. HB 406, which would require that businesses report a worker’s injury or death to the state Labor Department, which would be required to investigate. HB 365, which would increase the maximum project for net metering from 1 to 5 megawatts, allowing larger businesses and institutions to take advantage of that law. It would also account for it as a load reduction, which should help reduce the state’s peak usage. HB 663, which would redefine agriculture and existing agricultural uses to more broadly permit agritourism. HB 463 which would license pharmacist assistants. HB 692, which would require the Medicaid managed care program to provide dental benefits.